With the ever-growing popularity of platforms like Twitter and Vine, and even the self-contained nature of memes, you'd be forgiven for thinking that long-form content and media is starting to die out. For many years now, the rule of thumb for digital marketers has been that any blog posts or articles that they create have needed to be around 500 words; any less, and search engine algorithms wouldn't take notice; any more, and the user would immediately shut down and turn away from the content. “When readers started moving to the internet, media analysts thought long-form journalism was in trouble. Attention spans were going to shrivel. Readers wanted short, they wanted snappy, they wanted 140 characters and not much more (though a listicle on the side couldn't hurt). Who would want to scroll through an 8,000-word article on an iPhone screen?" This is an issue that has been raging for a few years now, as some specialists demanded shorter and shorter content whilst others strove for higher-quality content that offered real, usable information to the reader, but which ran the risk of putting the user off due to its length. Firstly; What Is Long-Form Content? Of course, just like anything else on the internet, if you go searching for a definition of long-form content you'll find a hundred definitions – often from less than a hundred people! Some people tend to think that long-form writing is anything above the limits of a Tweet or a Facebook post; others think that merely surpassing the 500-word mark makes a piece of writing long-form. On the flip-side, there are those who truly believe that a piece of content only becomes informative and worth reading when it covers multiple pages, is split up between different slides, or takes longer than twenty minutes to read. Personally, I tend to think that around 1,500 words is the ideal length for long-form content. You can always argue the 10% rule, which would make the absolute minimum I'd recommend is a word count of around 1,350. Of course, you can always go longer, but don't stuff your content, or make it overly difficult to read, just to get the word count higher. Remember that you aren't writing for search engine optimisation, not really – you're writing for people! You're writing to pass on worthwhile information to people who are interested, to express your opinion, or just to keep your reader updated. Answer: Long-form content is, typically, content that is written in excess of 1,200 words. It will usually cover multiple issues relating to a single topic and offer useful, comprehensive information to the reader. Why Should I Be Creating Longer-Form Content? Despite the belief that shorter content was the future of the internet, many are now beginning to realise that the “death" of long-form content was greatly exaggerated. Digital marketers and SEOers and a range of professionals from all over the world are realising that extended content is extremely valuable for both users and search engines alike! Aside from this, it gives you the opportunity to express your personality more and really make an impact with your personal or brand identity. It can be extremely difficult to express your individuality in 500 words or so, when you are trying to engage with another topic; with long content, with better content, you can make more of an impact on your customers. The one major downside of this long-content is that it takes much longer to create. On the flip side, however, one of its major advantages is that is takes much longer to write. It can be difficult to sell an employer or a business owner on two-three hours for an article when you could write a much smaller version in an hour or so, but longer pieces of writing are better. You can cover each topic in much more depth, spend longer proofreading and spell-checking your content and – as it is longer – it is also more likely that your user will spend more time viewing it, leading to more time spent on your site. Answer: There are a range of reasons why you need to start creating long-from content; advantages which really make the extra time you spend writing worth it! Is Longer Content Better For SEO? Google's algorithms are a mystery – everyone knows that, although most online advertisers will pretend to have some insider knowledge that sets them apart from their competitors. If you're wondering; no, I don't have any insider knowledge; but I do know what I'm talking about. Curious engineers and developers can, of course, tinker and experiment as much as search engines will allow them, to understand what forms of content rank well. As a copywriter and SEO expert, I have to rely on analytics, research and experience. Even as far back as 2012, serpIQ undertook an in-depth study which involved analysis of more than 20,000 keywords. One of the things that they discovered was that: “On average, 10th position pages have 400 less words on the page than first position pages. 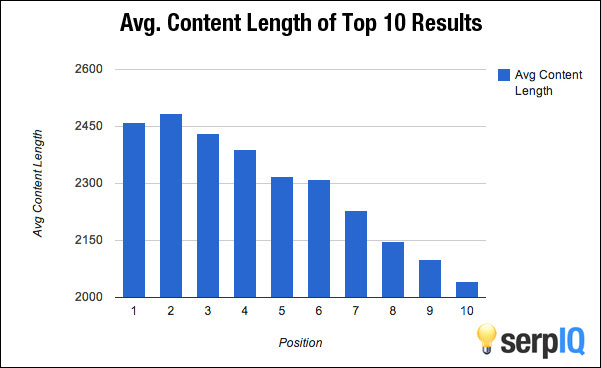 This does point to the trend that higher ranked sites have more content…"
As you can see, the results showed that the average content length for those in the top ten results was easily more than 2,000 words, and those that took the top spot had even more content, approximately 2,450 words. The average number of words for the top rankings was 2,416. Interestingly, the average number of words for the tenth spot was 2,032. That simple data speaks volumes for the future of long-form content within SEO. “Users often turn to Google to answer a quick question, but research suggests that up to 10% of users' daily information needs involve learning about a broad topic. That's why today we're introducing new search results to help users find in-depth articles." That's a massive hint which digital marketers and copywriters should be pouncing on, but seems to have gone relatively unnoticed amongst the grand scheme of things. In an industry which watches Google's every motion and movement like a hawk, it is odd that so many agencies have missed out on the hint. Aside from the native search benefits from longer pieces of writing, there is one more major advantage which 'experts' are missing out on – the generation of more backlinks. Not only will these links improve your site's overall rankings in SERPs, but it will also help to build your brand as an authority within your industry and create a great reputation in the community interested on topics that you write about! Moz, the be-all-and-end-all source for all things search engine optimised, conducted a study which showed a direct correlation between the length of content, and the number of backlinks pointing to it. Answer: Well-written, relevant and useful blog posts are great for search engine optimisation, and the longer they are, the better! However, don't make your content long just for the sake of being long, that will end up with lower quality writing, repetition of information and a high-rate of reader abandonment. Now, I'll be you're already inspired to race back to your word processor and start hammering at the keys, desperate to take advantage of the wide range of benefits associated with longer content? However, if you do rush off and speed-type a few thousand words in the time it would take you to create a five hundred word blog post, you're likely to end up with bad content. Similarly, remember that SEO isn't a race – it is a long-lasting, slow kind of marketing; by using long, well-written pieces of content, you aren't guaranteed to immediately shoot up the rankings and dominate your industry and have all your competitors come crawling to your knees to beg for your advice (as nice a mental image as that might be). The fact remains that Google's algorithms take a lot of things into consideration, and content is just one of them. However, we are certain that if the only thing separating you and your main competitor is the length of content, then whoever has the longest, best-written content will come out on top. How Can Writing Longer Content Work With Social Media? Creating content that is easily shareable on social media is one of the most common growth and engagement 'hacks' which digital marketers and other specialists need to be using. This is also a great way to increase conversions and spread the word around your business. Whilst it might sound surprising, long-form content shared via social media tends to out-perform its shorter brethren by a wide margin. Neil Patel, the mind behind Crazy Egg, undertook an experiment with some of his own content. Out of a total of 327 blog posts that he created for Quick Sprout (a great source for digital marketing tips!) he discovered that those posts with less than 1,500 words received an average of 174 retweets and 59 likes on Facebook. In comparison, those posts which went above 1,500 words would receive an average of 193 retweets and 75 Facebook likes. We'd recommend trying it yourself, and see how much more engagement and social signals your longer pieces of writing receive when compared to your shorter ones. There are a range of other examples of longer content affecting social media presences as well, such as NewsWhip's great article about their own social media. Answer: Whilst social media may often require short and snappy interactions, by cleverly naming your posts and articles and creating content like listicles and helpful guides, you can easily utilise your writing in your overall social media presence. Basing your content around a specific set of questions (like this one) and making sure that you answer them is also a great way to engage over social media! So; The Future Of Online Content Is Short And Snappy, Eh? Not by a long shot! What I would say, however, is that you need to ensure that your content is long and snappy! Just because your content exceeds 1,500 words, doesn't mean that it needs to feel like a long read. Take your time and create in-depth, interesting content that can really make an impression on your reader! Remember, too, that your content will still need a distribution system to work alongside it; otherwise, you'll be stuck with great content that very few people will ever see. Don't be afraid to put your content out there, share it on your own social media and always ask people what they think about it! But, to answer my original question, no; long-form content is certainly not dying out and anyone who thinks it is will suffer for it in the long-term!